I used to look forward to the durian season every year. Other than savoring the most delicious fruit in the world (not to some though), it is definitely a time of friendship and camaraderie--because normally, no one eats durians alone (unless you can't help it but buy the pre-packed ones in styrofoam containers). I remember the time when the durians that we bought were kampung durians, hence we wouldn't know what we have until we open up the fruits and try them. 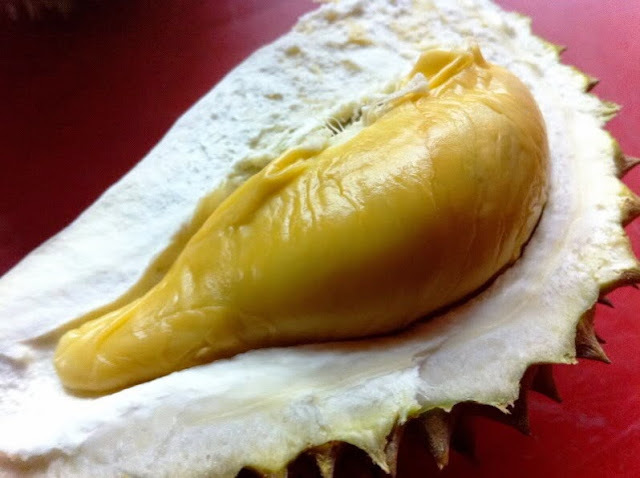 Everyone will surround the person who opens the durians and watch in silence too see what is in there--and then taste to see whether it is good or mediocre. Those were the good and fun times. I don't very much look forward to it any longer because I have to watch my diet since durians are really the most unhealthy fruit as well. It is one fruit that is both high in sugars and fats, and absolutely piled up in calories. So nowadays, if I were to eat durians, they have to be really, really, really good. The Musang King breed is my durian of choice for now. Moderately affordable and absolutely delicious. I had some in the office yesterday, courtesy of one of our bosses who owns a durian orchard and some today, purchased by my mom. But I have had enough for this year! In retrospect on yesterday's musings about heaven, the thought of freely enjoying the best breeds of durian without health consequences is just so delightful!